If you have enough free contiguous memory available (dependent on Windows memory management), you can lock folders or files up to 2 Gb. 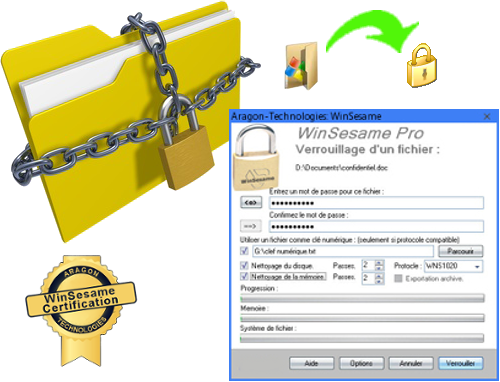 WinSesame can lock folders containing up to 5000 files. In practice these limits should not prevent you from protecting all the documents on a computer, as for reasons of compatibility with differing file systems, no software creates files bigger than 2 Gb. If you need to lock folders containing more than 2Gb data, these are thus contained in several files of compatible size which can be locked independently without problem. This has moreover the advantage of faster access to the protected data, and better security by avoiding unnecessary opening of a large folder in its totality. In practice when a folder contains a large number of small files you lock the folder. When a folder contains files of large size it is better to lock the files independently.